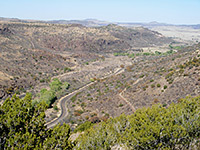 The Davis Mountains are one of the more prominent parts of a long chain of hills in west Texas stretching from Big Bend NP to the Guadalupe Mountains, surrounded on all sides by low plains of the Chihuahuan Desert but rising high enough (8,000 feet) to support a more temperate environment. Hence the plant life is rather different to the desert below, with trees, tall grass and other species not found at the lower elevations. 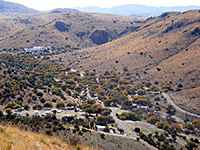 State highways 166, 118 and 17 wind through the mountains and pass plenty of overlooks, access points and potential free camping places, but for developed recreation the only location is Davis Mountains State Park, a small (2,708 acre) preserve that has a campground, visitor center, nine miles of hiking/horse riding trails, several bird watching sites and a 2.5 mile scenic drive, while just outside the park is Indian Lodge, a rustic hotel. 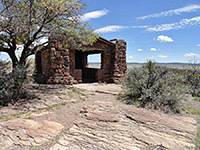 The state park adjoins Fort Davis National Historic Site - the two are linked by one of the trails - and is 4 miles from the town of Fort Davis at the southeast edge of the mountains, which extend northwards for 35 miles. Camping is the main reason to visit the state park, as the scenery is no different to all other parts of the mountains which may be visited free of charge. The campground has 94 sites, some full hookups, all well shaded, along a paved road through a shallow valley (Keesey Canyon) in the middle of the park. 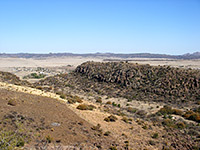 The sites have pleasant views of the grassy slopes and tree-covered surroundings, though no extended vista of the desert below. Past the campsites, the road ends at Indian Lodge, a historic pueblo-style hotel constructed in the 1930s, offering 39 rooms, wi-fi, a swimming pool and a restaurant. The other park road (Skyline Drive) ascends to a ridgetop and follows it eastwards a way, passing several viewing areas that look out across the hills towards the flat desert in the south. 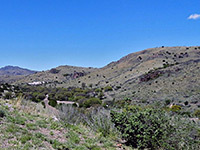 The drive ends at a covered enclosure above the upper part of Hospital Canyon, a short drainage leading into Fort Davis NHS; the 1.5 mile path to the site (not to be used after 5 pm) descends the hillside gradually and enters the complex near the restored hospital building. Several other trails start from the campground, the north side of hwy 118 and along the scenic drive, most climbing hills to other viewpoints. The Davis Mountains are volcanic in origin and are sprinkled with frequent outcrops of rounded basalt boulders, but the majority of the landscape is soft, undulating hills, greenish-yellow in color, wooded in a few areas but mostly covered by grass. 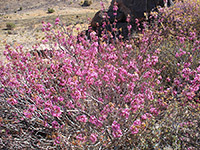 Common plants and trees include ponderosa pine, pinyon pine, oak, juniper, sumac, catclaw acacia and Torrey's yucca. Apart from Indian Lodge and a few motels in Fort Davis, the nearest places with lodging are Alpine (28 miles) and Pecos (77 miles).